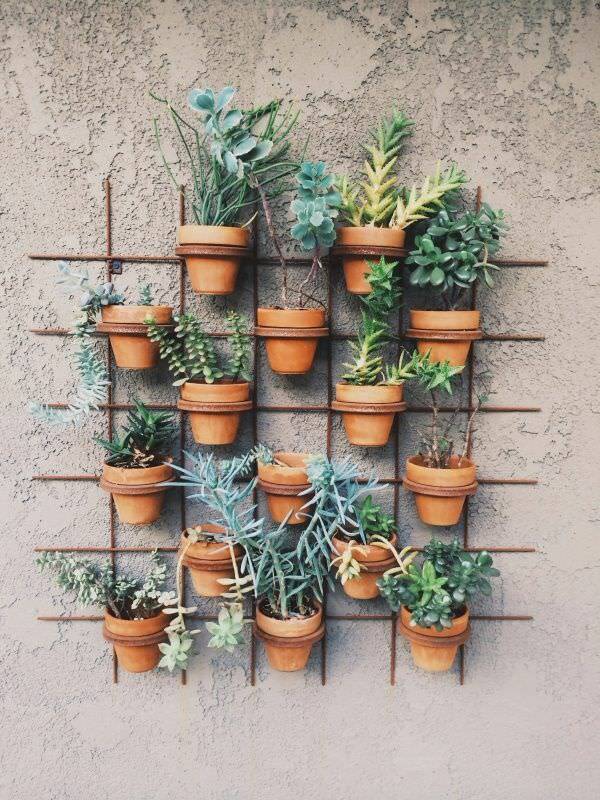 This clay pot vertical garden is an excellent way to add some greenery to your house without occupying any space. If you want to spruce your balcony, this is the perfect design to do it. The full tutorial to create this design is available here. This amazing vertical garden wall is made of rectangular plastic trays divided into planting cells, all slanted at a 30-degree angle with bottom holes that promote drainage and aeration. If you want to achieve the wall art in this picture, you will need to add a wood frame. Plant the trays with succulents which its shallow root systems are well-suited for trays with 2″ x 2″ cells. If you want to plant other plants than succulent, choose larger 4″ x 4″ cells especially when planting small annuals, perennials, and edibles such as lettuce. 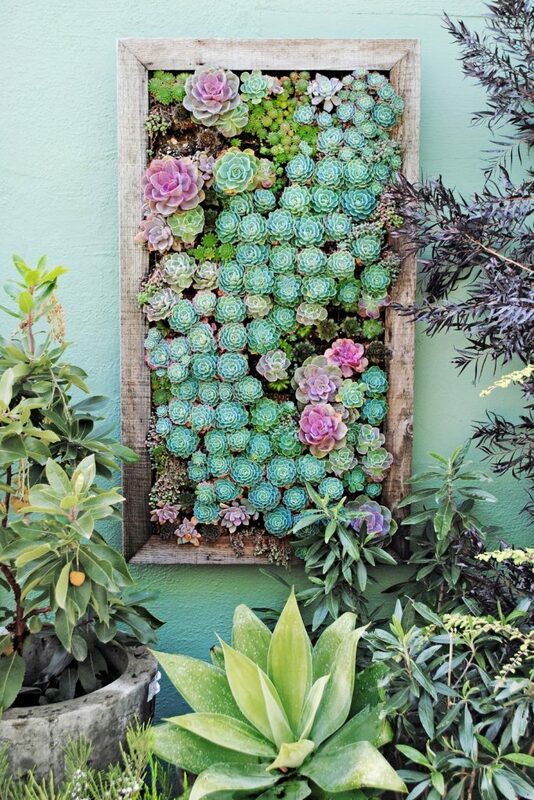 If you like how beautiful succulent is, check out these amazing decorative succulent ideas. This is another stylish decorative vertical garden wall. This living wall is made of trellises. These trellises are easily made. All you need is planters, spray paint, wooden boards, ga rommet setter, and leather. All together they cost around 60 bucks. With this trellis wall garden, you have the option to include several different types of plants. You can get detailed instructions to build this model from here. 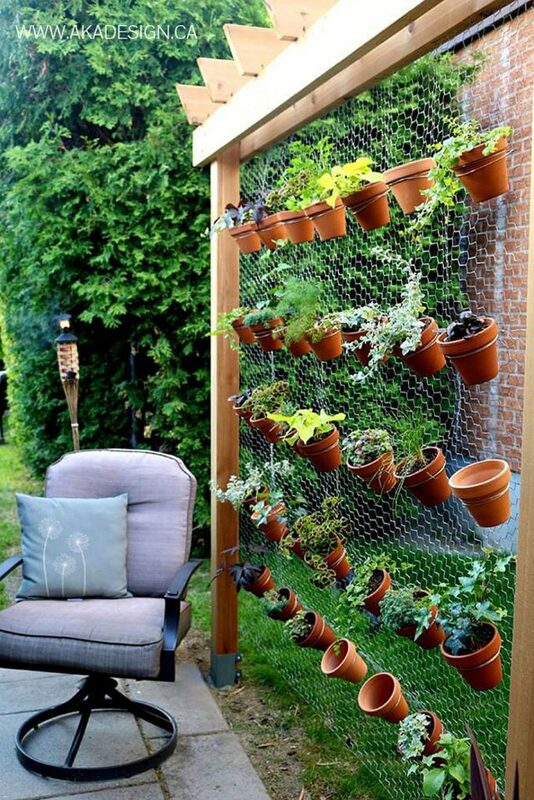 The stand-alone vertical garden is built by affixing hex wire netting to a cedar frame. It can hold up to up to 35 small terra-cotta pots. In order to build this beautiful vertical garden wall, you will need ground spike, hex wire netting, fence staples and terra cotta flower pots. Don’t let the beauty of wall fool you. All the mentioned materials will cost about 35 dollars. If you want to know how to build this design, visit this site. This is a beautiful, simple and classy vertical garden wall. The unity of colors adds charm to this decoration. The advantage of this wall planter is that it allows you to decide the amount of the space you allocate to your garden. This vertical garden wall is a bit more expensive than the others. It costs 140 dollars. But come on!! that is nothing in comparison to such beauty. Take a look at these orientations to master this design. This is definitely another enchanting vertical garden wall. It is also simple and easy to do. This hanging planter is made up of five wooden planks with openings that let pots dangle. The planks are spaced evenly between two pieces of rope and are secured with zip ties for a uniform look. 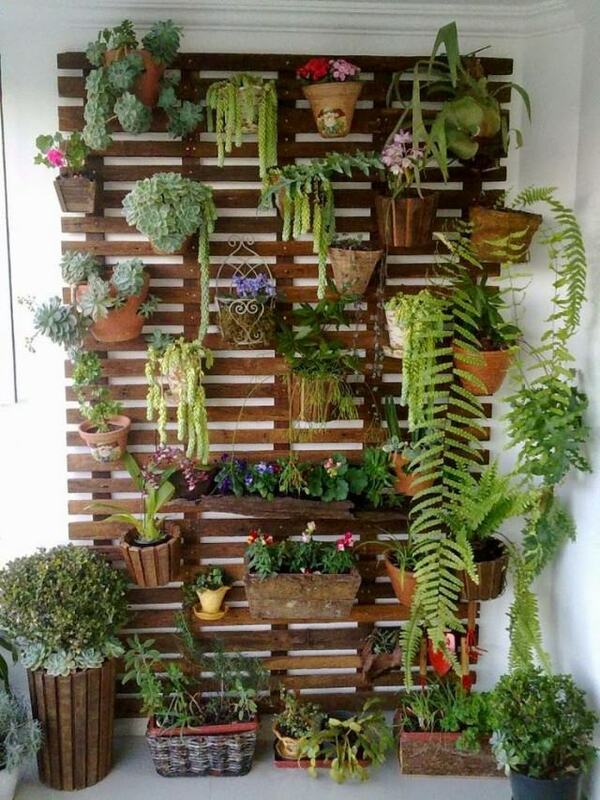 This adorable indoor vertical garden wall is made of vertical pallet planter. It is also inexpensive and easy to do. 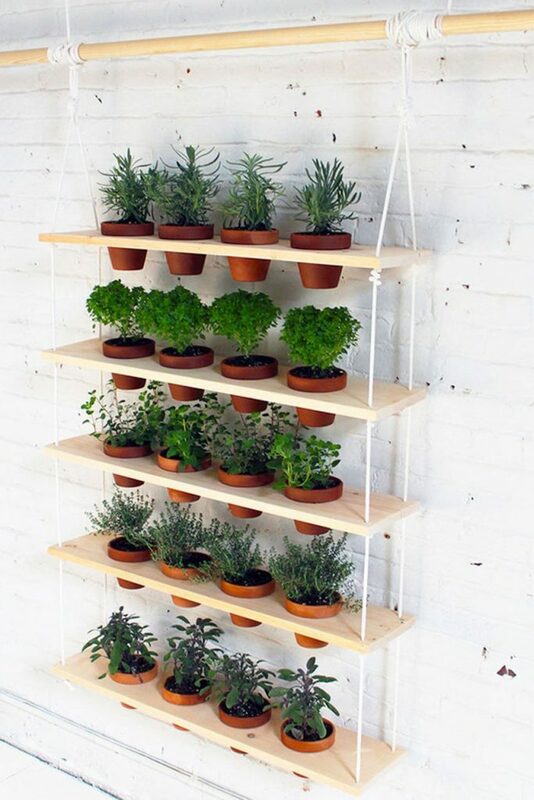 Besides, it provides enough space to grow herbs and succulent without occupying and floor space. 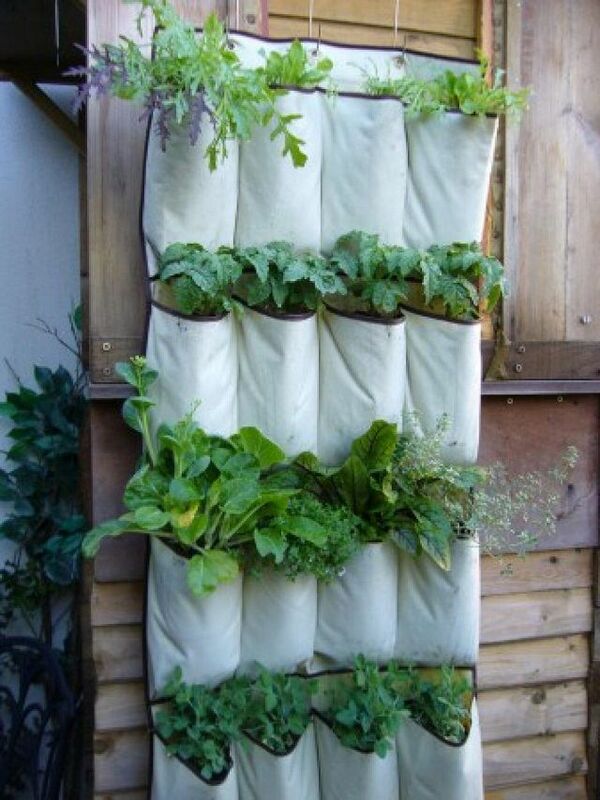 It is the perfect vertical garden for people who lack space in their houses. you could learn how to build one with one click here. 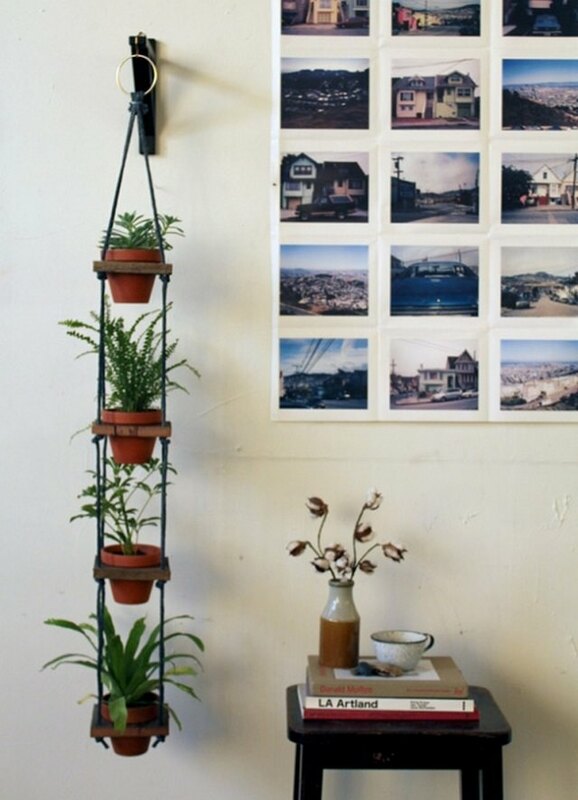 This is a practical vertical garden idea. 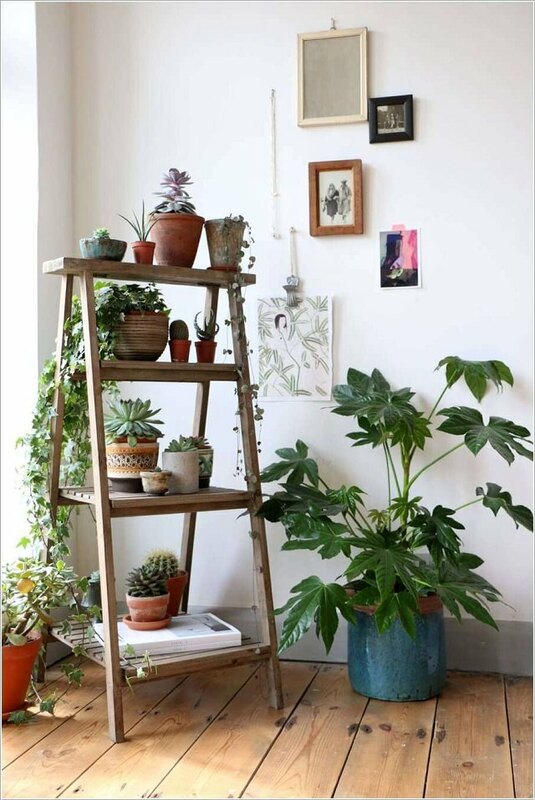 An old ladder is perfect to grow multiple houseplants in limited space. This design is easy to combine together. All you need is to add several wood planks on ladder steps to create shelves. Afterward, plant your houseplants on it. However, you should keep in mind to place houseplants that have similar light requirements otherwise some of them will die. 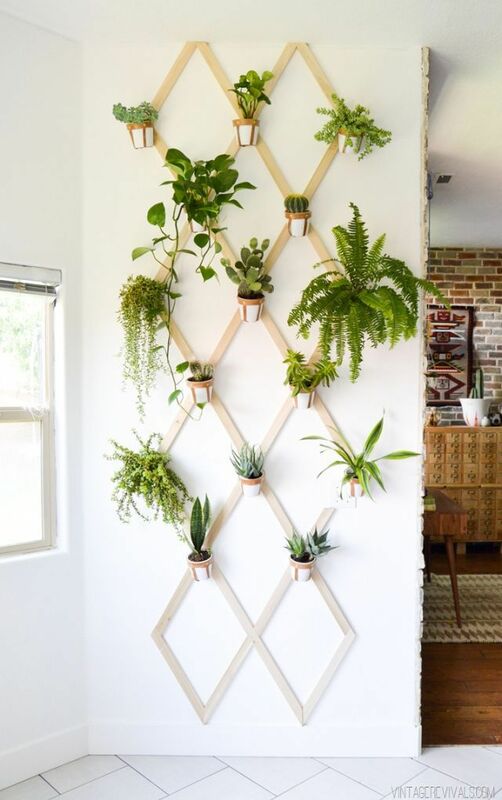 This is definitely a unique way to show your houseplants. 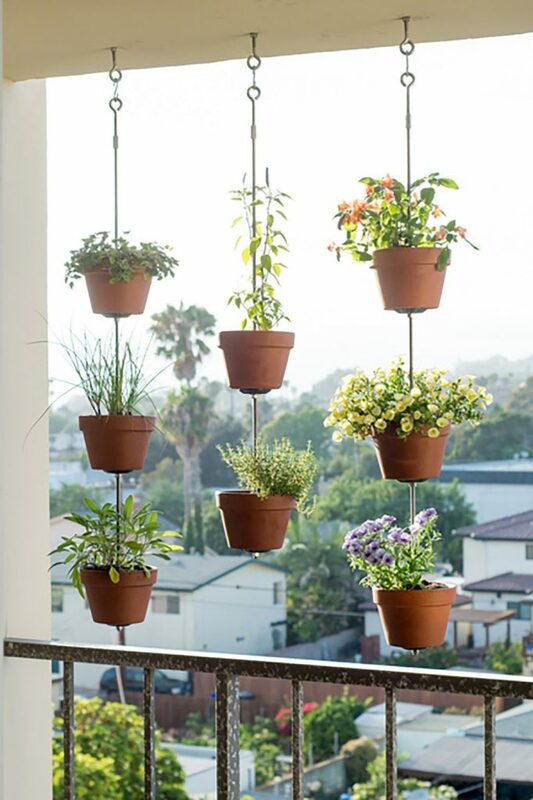 Hanging pots could make a beautiful and original vertical garden wall. Besides, it is easily made. 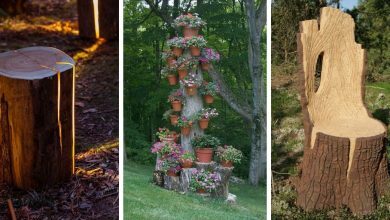 This vertical garden, for example, is made of some scrap wood, rope, and a few basic woodworking tools. What I like the most about this vertical garden wall idea is its clever watering system. Indeed, it is amazing. This system makes watering a breeze. You don’t have to water all the plants. You just need to water the on top plant and all the runoff from the previous pot drips into the plants below. Just don’t forget to place a saucer under the bottom-most pot. Here is a full tutorial on how to make one. Do you have an old TV stand? 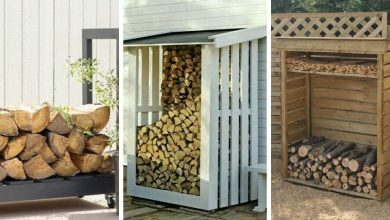 pull out of the garage and make use of it. As you can see in this picture, TV stand can make a decorative vertical garden wall. This is a great way to recycle your old TV stand and transform it into a living beauty. 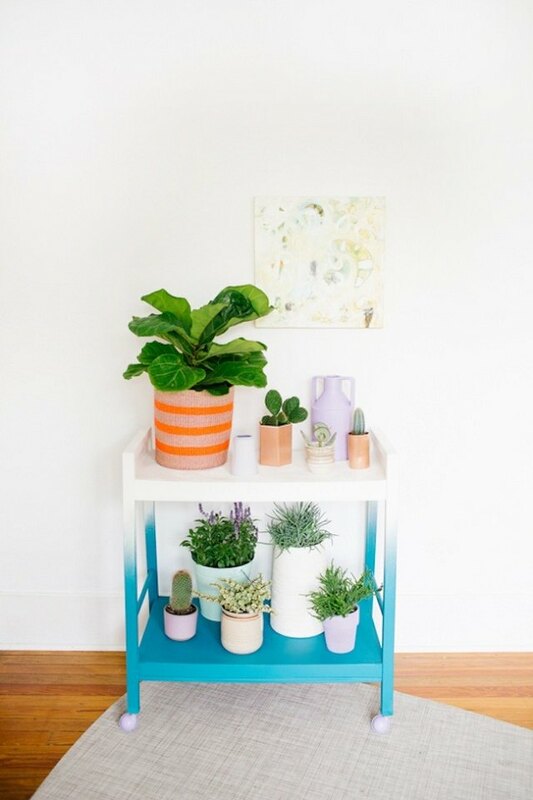 If it is too rustic, you can paint it with a color that blends with your houseplants. A hanging Shoe organizer can be a beautiful decorative vertical garden wall. Its pockets are the ideal size for growing individual plants and herbs. Besides, it costs nothing. You already have one in your house. details and instructions to build this innovative design are available here. 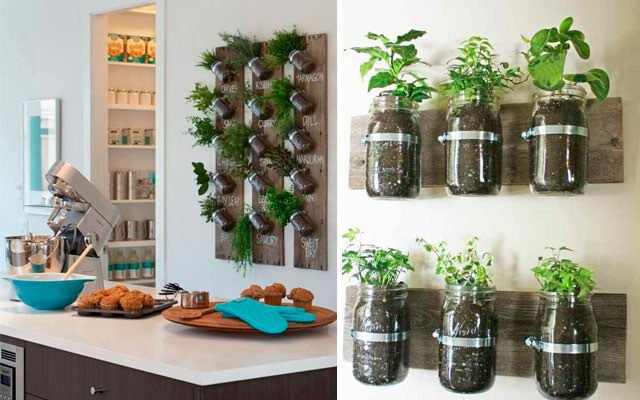 DIY vertical garden wall idea offers you an opportunity to benefit from your old mason jars with this design. This is an absolutely beneficial and beautiful idea. Who thought that old mason jars could make such a charming and eye-catching decoration. Hold the jars with metal bands and screws against a scrap piece of wood that is mounted on the wall. Fill in the soil and plant your favorite plants. For more information about mason jars, click here. This is just amazing and beautiful. It is absolutely an artwork. they will look beautiful in any room. 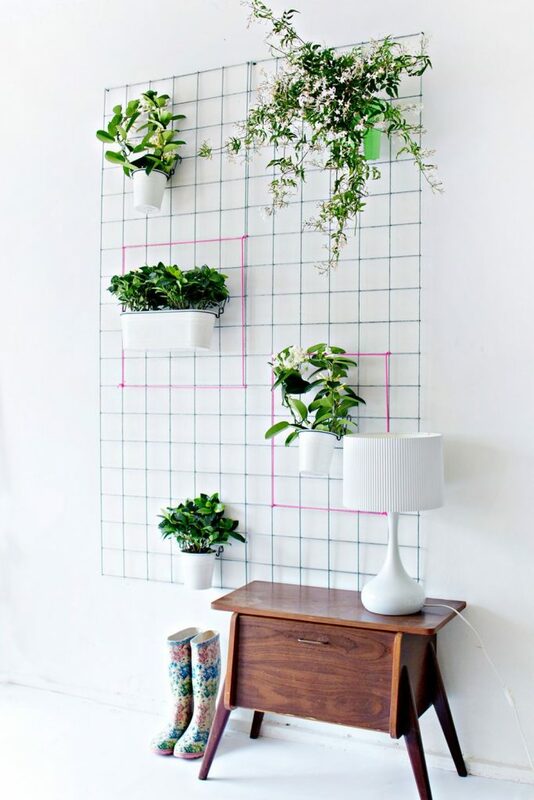 This fascinating DIY vertical garden wall looks complicated but it is not. In fact, it is quite simple. 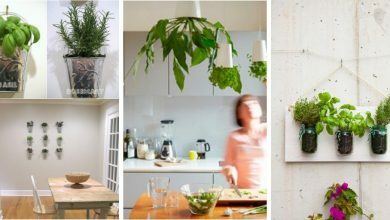 All you need to do is to Arrange a pallet board and hang several pots on it and you will have a lot of vertical space to decorate the way you want. 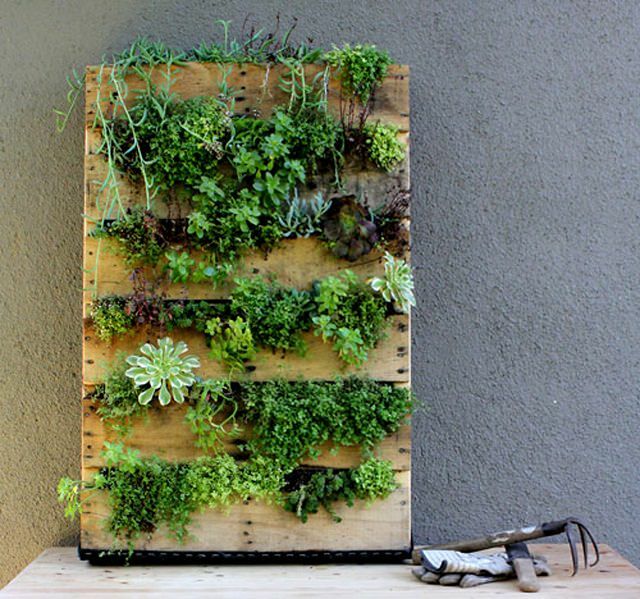 This is a perfect vertical garden for people who want to grow herbs but they lack space. A wooden plank is a base to create this design. 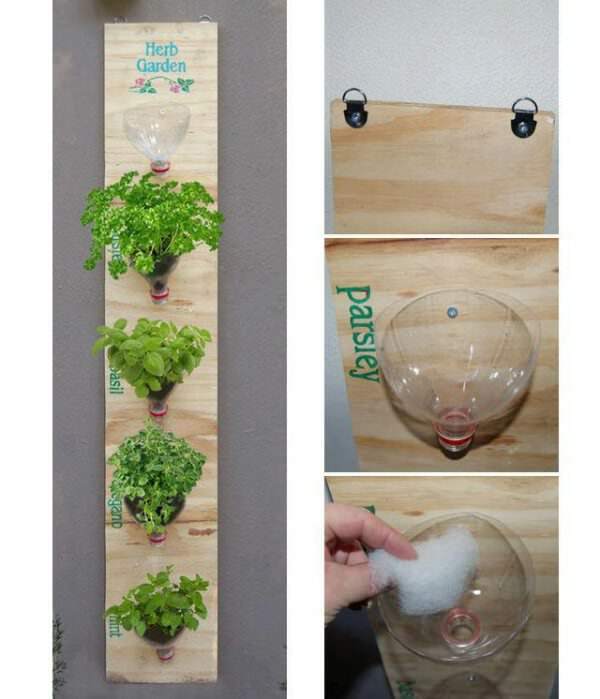 All you need is some plastic bottles, hooks, nails, and hammer and you’re all set to grow your own herbs. You can create this iron grid pot holder by welding the iron rods or weave them by any other method so that you’ll be able to hang the pots. It is a quite simple but decorative design. You could use to decorate empty walls in your house. You can paint the grid in your favorite color. 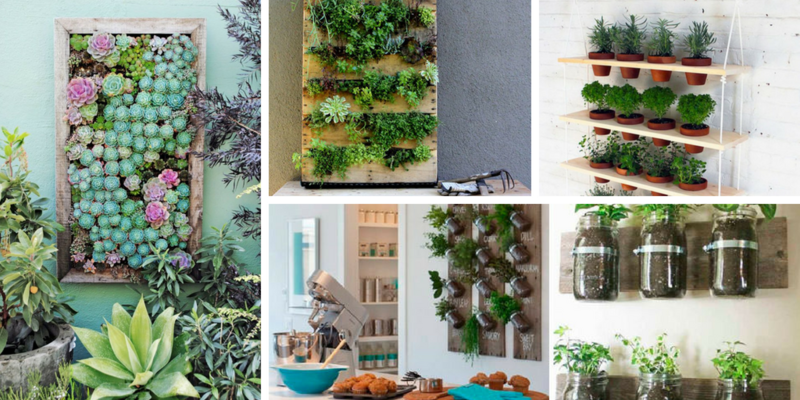 These are the ultimate DIY vertical garden wall ideas. They are the perfect decoration for empty walls in your houses. 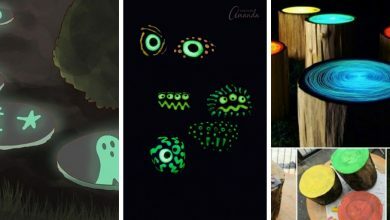 Their appealing visual aesthetics will definitely make your room look alive. Besides, most of them are not expensive at all. If you like these designs, share them with friends and tell them about us.